Sure, safety is a big factor in this requirement. Before OSHA was created in the early 1970s, accidents and injuries occurred without much thought to what types of preventative measures should be put in place. Safety is the number one priority of OSHA – and if you run a company that uses aerial lifts or scissor lifts, it should be yours, too. However, one of the secondary benefits of a thorough training program has to do with financial return on investment (ROI). ROI is a foremost concern for most business owners. In order to boost bottom line revenue, smart decisions are mandatory for solid ROI. The safety advantages of training are evident. At CertifyMeOnline.net, the leader in 24/7 OSHA compliant aerial lift and scissor lift training, we’re all about safety and ensuring total company compliance across your AWP fleet. What’s more, with a small short-term cost for training initially, you’ll save money in the long term. Let us explain how this works. The link between a well-trained workforce and costs savings might not be apparent at first. But if you think about it from a different angle, it’s easy to see. Take any business – your business. If you’re reading this blog, there’s a good chance you already work with aerial lifts or scissor lifts. As you already know, training is absolutely imperative for any business with AWP operations. So how does this save money? Let’s put a landscaping enterprise front and center for our example. Most landscape businesses utilize cherry pickers and other types of aerial lifts to access tree branches, tall shrubs, and other plants. Now, imagine a landscaping company just hiring anyone that walks into their office for a job – no training required. Sounds insane, doesn’t it? Think about the accidents that would occur. Forget the fact that the company would lose money from dissatisfied customers. There would be serious mishaps with the equipment. Tip-overs, overhead hazards (including power lines), and stability requirements – just to name a few factors – would cause many accidents, and eventually a fatality. OSHA fines and penalties can exceed $100,000. Add in the legal costs and serious damage to this landscape company’s PR, and it’s easy to see how training saves money! Training from CertifyMeOnline.net is the ultimate insurance policy against financial disaster. Aerial lift operators without training are inefficient. This results in more hours to complete jobs, more insurance costs, etc. Customers will eventually leave. When there’s a serious training gap in any workforce, it eventually shows in performance – and customers will go elsewhere. Online training avoids needless expense, offsite venues, and other inconvenient arrangements. 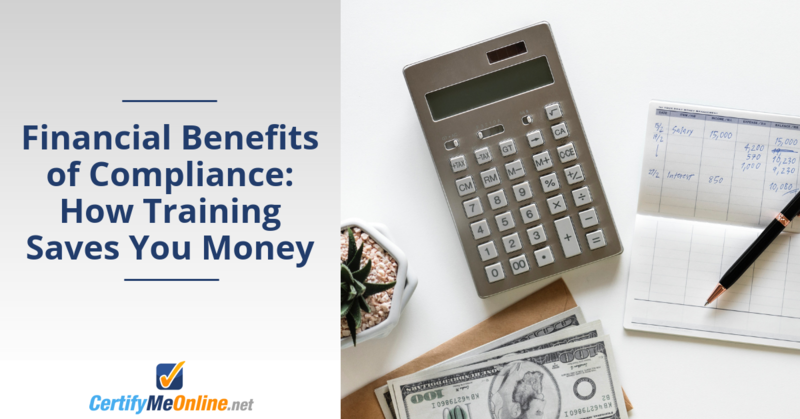 With internet-based training (like CertifyMeOnline.net), companies are able to save money on traditional training costs. The future is already here, and CertifyMeOnline.net is leading the charge to get aerial lift and scissor lift operators certified! CertifyMeOnline.net is your best option to save money – and also prevent accidents and injuries on the job. All employers must provide training for their employees. Maximize your ROI – and your safety quotient – with our aerial lift and scissor lift training courses. Take the first step in better safety and a boost to your bottom line…register today! If you have any questions about our training, OSHA compliance, or the true cost of non-compliance, our aerial lift and scissor lift training specialists would love to speak with you. Call CertifyMeOnline.net today at (602) 277-0615.